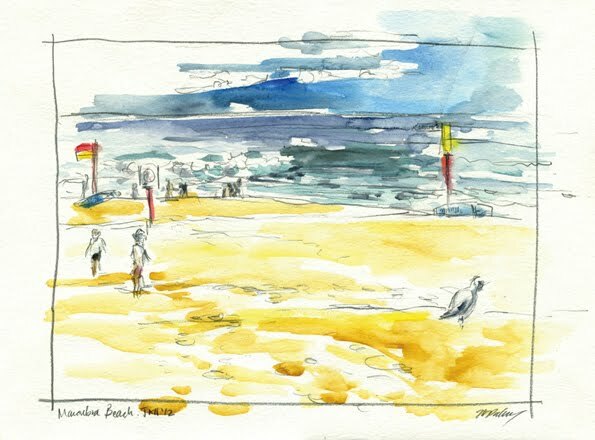 Urban Sketchers Australia: Hot, hot, hot, cold! Spent the day with my family while my nephews are still on school holiday. We first went to see The Art of the Brick Lego exhibition at Sydney Town Hall. I managed to fit in some quick sketches while we were there, but its always hard when you're with others who aren't sketching too. We later headed back to my brother's place, and popped over to Maroubra Beach to throw a little frisbee. The ENTIRE week was sooo hot, but the day we went – it was so cold, and so freakin windy. People were flying kites and paragliding! But I was determined to do some sketching as I vary rarely visit the beach.